The AERC Convention in Reno is just around the corner (February 29 - March 1, 2008). The EasyCare booth will be set up to make repairs. If you are planning on attending the convention and are need of hoof boot repairs be sure email us what parts you need and we're happy to repair your Easyboot, Epic, Bare, Grip or Custom Hoof Boot (2005 and newer models) for you. In return we ask that you make a donation to the AERC Trails Fund. For your convenience we'll have a donation box at the repair table. Karen and Chief will be there along with some of the EasyCare team. We'll be in booth # 105 & 107. So be sure to stop on by and say hello. We'd love to see ya! 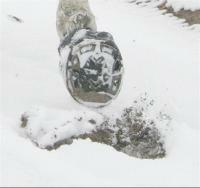 Easyboot Grips in the Snow!! 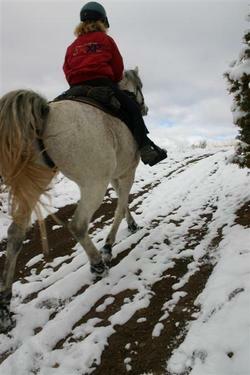 A recent snow fall was the perfect opportunity for Karen Chaton and Dave Rabe to take their horses out for a ride. 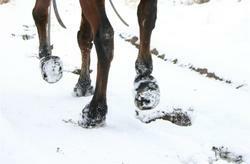 They outfitted their horses with Easyboot Grips and hit the trail. Karen said they had a fun ride and the horses did so well with them. 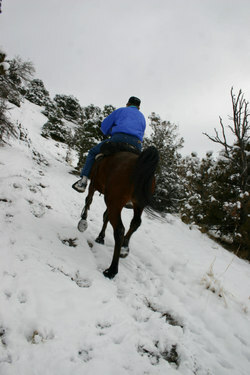 The Grips allowed them go up and down steep hills without ever slipping! Click here to check out the great shots taken on their ride. Get a Free Pair of EasyCare Gloves with the Easyboot Grip!!! We're starting off the new year right by offering something FREE! So during the month of January you can get a pair of EasyCare Gloves when you purchase an Easyboot Grip! 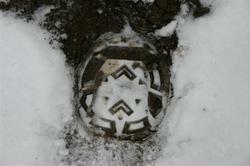 As the winter weather approaches and your favorite trails become saturated in mud and covered in snow it's time to get out the Easyboot Grips. Grips give the extra amount of traction needed for winter riding conditions. Karen Chaton and Dave Rabe put the Grips to the test on Sunday. Riding in those type of conditions. Looks like a blast!